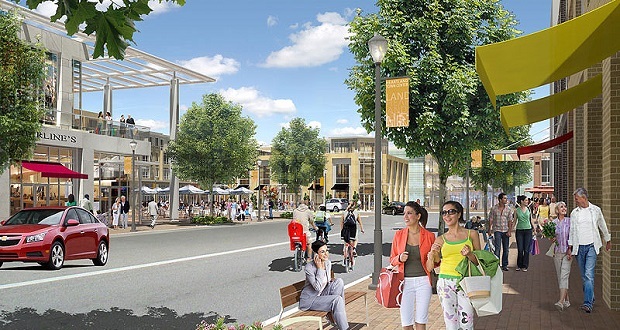 In a vote that took little over 15 minutes yet backed by 15 years of substantive planning, the Town of Islip approved Phase 1 of the Heartland Town Square project in Brentwood recently. This action included 113 acres of development containing 626,000 square feet of office, 560,000 retail, 3,500 apartments and 215,000 square feet in public space. The developer pays $9 million for infrastructure and $3 million to the town for processing and services. Ten percent of the units will be affordable under Islip’s standard. The second phase of the project will not be considered before Phase 1 is complete. The Phase 1 approval contains roughly 25 percent of the proposed commercial, 35 percent of the proposed residential and a cut to the height of the buildings. The compromise allows the most economically viable elements of a new town center to emerge while monitoring and regulating the impacts of the project. This was one of the most thoroughly planned, reviewed and analyzed project in recent history. The Town of Islip should be praised for this compromise plan including Supervisor Angie Carpenter, members of the board along with current and past planning staff, Planning Board and many others for their multi-year commitment to reviewing the project. It was heartening to see support from the Brentwood community at the many public hearings through the years. While this proposal was under review, 40 downtowns have approved projects to redevelop Main streets across LI. We have heard consistently that Brentwood residents want the same opportunities as those other neighborhoods. The prospect for construction and permanent jobs along with the positive multiplier effect on the local economy were an often heard public benefit. During the last 15 years of planning, the project has seen large support from Brentwood but received opposition from some folks outside of the community. Much of the regional opposition has ranged from school district overcrowding, infrastructure impacts and concerns that the jobs generated will not go to the local labor force at fair wages. Economic studies and local case examples show this project to be largely tax positive to the community. There will be a minimal school district impact as smaller projects across LI have on average 3 school kids per 100 units. Using the standard of built mixed use projects there would be well under 500 students generated – not the 6,000 that some speculated. The approval of Phase 1 allows for the opportunity to pull in state and federal dollars to advance transportation infrastructure like widening the Sagtikos Parkway. Due to the radical scaling back of the project traffic impacts will be substantially reduced. The one remaining issue involves apprenticeship programs and securing local jobs on the project. There is hope this can be addressed at the Town of Islip IDA level if it can’t before the Town Board as part of the land use process. There has been some commentary that the Suffolk County Planning Commission will seek to reverse this compromise decision. That would be a mistake. After 15 years of substantive planning no one wants to see a sideshow that has the potential to overturn a local municipality’s decision. Land use control by the Town of Islip and any municipality on LI needs to stay intact as very few people want to see regional zoning control. Large scale projects are the hardest to plan and approve but the Town of Islip got this one right. Kudos to the town, the developer and the Brentwood community for coming out to support the project over many years. Let’s see a long awaited town center emerge from the grounds of a former psychiatric facility.